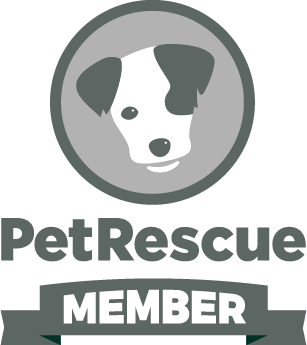 Small pet rescue group located in Sydney. Please call, text or email Michelle to organise a phone 'interview' regarding the pet you are interested in adopting. My primary objective is to find the perfect match for the pet so it will not simply be a first come first served adoption. Next an appointment can be made to meet the pet. 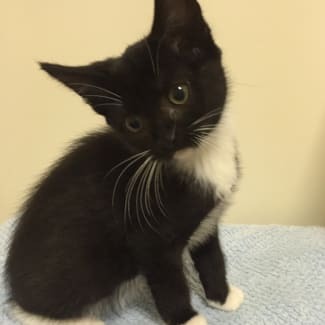 Should you wish to adopt after the meeting, all paperwork will be filled out and the adoption fee needs to be paid in either cash or bank transfer. A home inspection will be required and I will bring your new pet/s at this time, or you can email photos instead. You will then have a two week trial to ensure both you and your pet are 100% happy, and a full refund is offered if the pet/s is/are returned during this trial period. At any time after this trial period, should your circumstances change and you can no longer care for your pet, please contact me as I will always take them back should the need arise - for the rest of their lives. Michelle. Bella (F), Apollo (M), Ollie (M) and Polly (F) were rescued from the pound along with 2 other siblings and their mummy whom have since been adopted. Foster carer Claire, her toddler, and own pets, have lovingly raised these cuties but with not enough laps to snuggle into we're now looking for some super loving families to adopt a darling or two for life. They are all fully vaccinated, desexed, microchipped and on worm and flea prevention. Adoption fee is $150 or $200 for a pair. This gorgeous family are located in Peakhurst Heights. Please call Michelle on 0451 033 823 for more information or to arrange a meeting. 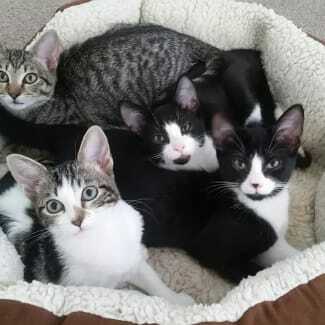 Ollie (M), Apollo (M), Polly (F) and Bella (F) were rescued from the pound along with 2 other siblings and their mummy whom have since been adopted. Foster carer Claire, her toddler, and own pets, have lovingly raised these cuties but with not enough laps to snuggle into we're now looking for some super loving families to adopt a darling or two for life. They are all fully vaccinated, desexed, microchipped and on worm and flea prevention. Adoption fee is $150 or $200 for a pair. This gorgeous family are located in Peakhurst Heights. Please call Michelle on 0451 033 823 for more information or to arrange a meeting. 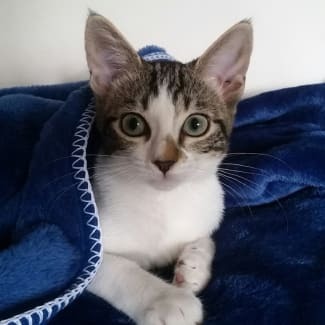 Freya and her siblings are beautiful, healthy, sweet and mischievous kittens. Freya absolutely loves to rumble with her siblings: Luna (adopted), Frida, Magnus, Sebastian (adopted) and Valdamar. Freya is a beautiful, gentle girl who is often the most daring of the sisters. She is affectionate, cuddly and adores her family. 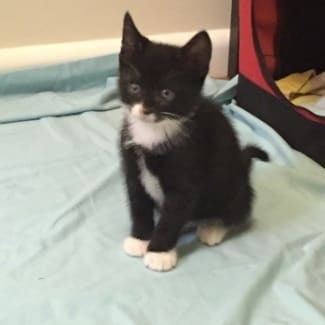 Freya only has half a tail due - it appears someone cut her tail as a baby :-( Freya has been raised with a house full of adult cats and three big dogs so will be comfortable around cats and cat friendly dogs. They all very much love each other, seeking out their siblings for play and for cuddle/sleep time so I would prefer they are adopted in pairs. The adoption fee for a pair will be $300 total. Please contact Michelle on 0451 033 823 or michellenielsen@live.com if you would like to meet Freya and her family. We are located in Cherrybrook. Magnus and his siblings are beautiful, healthy, sweet and mischievous kittens. Magnus absolutely loves to rumble with his siblings: Freya, Frida, Luna (adopted), Sebastian (adopted) and Valdamar. 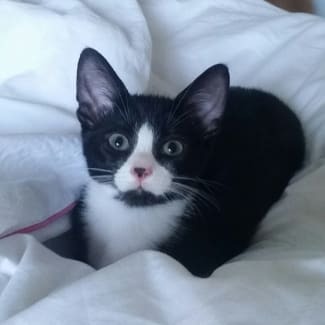 Magnus was the second smallest kitten at first but has grown into such a gorgeous and confident young boy. He is very affectionate, and has a very loud purring machine tucked away inside. He is so sweet and gentle, giving little loving kisses whenever close. I was so afraid for this boy when I first got him. He was so sick I honestly didn't think he would survive the night and I was told to prepare for the worst but thankfully by morning this strong little boy had pulled through. They've been raised with a house full of adult cats and three big dogs so will be comfortable around cats and cat friendly dogs. They very much love each other, seeking out their siblings for play and for cuddle/sleep time so I would prefer they are adopted in pairs. The adoption fee for a pair will be reduced to $300. Please contact Michelle on 0451 033 823 or michellenielsen@live.com if you would like to meet Magnus and his family. We are located in Cherrybrook. Valdamar and his siblings are beautiful, healthy, sweet and mischievous kittens. Valdamar absolutely loves to rumble with his siblings: Frida, Freya, Luna (Adopted), Magnus and Sebastian (Adopted). Valdamar is by far the largest of the litter and equally as cheeky as the others. He is super affectionate, so quiet and unassuming, yet quick to join in with any games. He's a loud purring machine when snuggling and is almost never alone, preferring to be either wherever his brothers and sisters are, or snuggled as close to you as possible. I love this boy so much. They've been raised with a house full of adult cats and three big dogs so will be comfortable around cats and cat friendly dogs. They very much love each other, seeking out their siblings for play and for cuddle/sleep time so I would prefer they are adopted in pairs. The adoption fee for a pair will be reduced to $300. Please contact Michelle on 0451 033 823 or michellenielsen@live.com if you would like to meet Valdamar and his family. We are located in Cherrybrook.